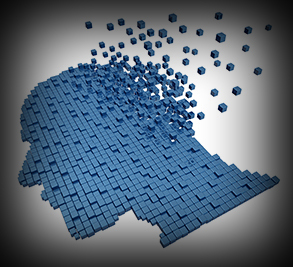 Have you noticed memory problems piling up in ways that affect daily life in yourself or someone you love? Do you find yourself struggling to follow a conversation or find the right word, becoming confused in new places, or botching tasks that once came easily? More than 5 million Americans have Alzheimer’s disease, and estimates suggest it will affect 13.8 million by 2050. Already, it is the sixth leading cause of death in the United States. 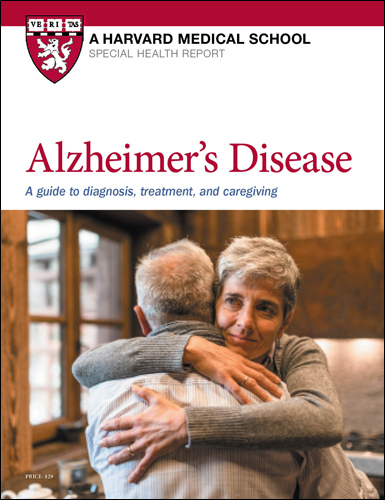 This Special Health Report, Alzheimer's Disease: A guide to coping, treatment, and caregiving, includes in-depth information on diagnosing Alzheimer’s and treating its symptoms. Have you noticed memory problems piling up in ways that affect daily life in yourself or someone you love? Do you find yourself struggling to follow a conversation or find the right word, becoming confused in new places, or botching tasks that once came easily? Everyone has these experiences sometimes, but if they frequently happen to you or someone you love, they may be early signs of Alzheimer’s disease. About 5.4 million Americans have Alzheimer’s disease, and estimates suggest it will affect 7.7 million by 2030. Already, it is the sixth leading cause of death in the United States. There is no cure, and available treatments alleviate symptoms temporarily at best. But with patience, knowledge, and support, you can better meet the challenges posed by this disease and improve the quality of your life and that of your loved ones. This Special Health Report includes in-depth information on diagnosing Alzheimer’s and treating its symptoms. Because caring for someone with Alzheimer’s continues to be one of the toughest jobs in the world, the report includes help for family members and caregivers, as well as for the individuals with Alzheimer’s. Because the disease is progressive, coping with it requires foresight and careful advance planning. People in the early stages of Alzheimer’s often can be partners in that planning, and this comprehensive report can guide you, as well. You’ll find tips for coping with daily routines and challenges, getting financial and legal documents in order, investigating long-term care options, and determining what services are covered by health insurance and Medicare. Is it Alzheimer’s or another dementia? Here are some common warning signs of Alzheimer’s disease. If you or someone you love is experiencing one or more of the following symptoms, talk to a doctor. The medications used to manage Alzheimer’s disease work best in the early stages of the disease, making an early diagnosis significant. Trouble remembering things. At first, only short-term memory may be affected. The individual may forget an appointment or the name of a new acquaintance. She may also forget where she left things, or she may leave things in odd places (for example, putting her shoes in the microwave). Eventually, long-term memory also is impaired, and the individual may not recognize family members. Mood or personality changes. The person may suddenly become angry or sad for no apparent reason. Or someone who was social and outgoing may become withdrawn. The person may also become stubborn or distrustful. Depression also often accompanies Alzheimer’s disease, bringing such symptoms as loss of interest in a favorite hobby or activity, a change in appetite, insomnia or sleeping too much, lack of energy, and hopelessness. Trouble completing ordinary tasks. Simple tasks that once caused no difficulty may become much more challenging. For example, a person may forget how to use the oven, lock the door, or get dressed. Difficulty expressing thoughts. It’s common for people with Alzheimer’s disease to have trouble with language. The individual may try describing an object rather than using its name — for example, referring to the telephone as “the ringer” or “that thing I call people with.” Reading or writing may also be impaired. Impaired judgment. The individual might have trouble making decisions, solving problems, or planning. For example, he may no longer be able to balance a checkbook or pay bills. Disorientation. We all know what it’s like to be driving and momentarily forget where we’re going. But those with Alzheimer’s disease may get lost in their own neighborhood. They may also lose track of dates and the time. Unusual behavior. The individual may wander, become agitated, hide things, wear too few or too many clothes, become overly suspicious, engage in unsafe behaviors, or use foul language.